Country music superstar, Charles Kelley, member of the six-time Grammy Award-winning band Lady Antebellum, and his wife Cassie Kelley, will use their larger-than-life artistic talents to help raise money for elephant conservation by designing a model elephant to be auctioned off during the 10th annual King’s Cup Elephant Polo Tournament in Hua Hin, Thailand on September 10th, 2011. Anantara has partnered with some of the most celebrated names in the music, fashion, television, and business worlds to harness their generosity and creativity to work towards elephant conservation. Alongside Cassie and Charles, Kim Jones, head designer for Louis Vuitton; Charm Osthanond, Thai TV star; and supermodels Cindy Bishop and Lookade Kingpayome will all participate in designing an elephant for the auction. Each celebrity will have one month to transform a small plain wooden elephant into a work of art to be auctioned off on the last night of the tournament. All proceeds from the auction will be donated to Anantara’s own Golden Triangle Asian Elephant Foundation, which will in turn donate the proceeds to various elephant projects around the country. The King’s Cup was introduced in 2001 by Anantara Hotels Resorts & Spas, and to date the tournament has raised over $300,000 for the National Elephant Institute, which provides medical care and sustenance to Thailand’s elephant population and employment and training for their mahout handlers. Proceeds from last year’s tournament also went to fund the first-ever elephant therapy program, which explores the benefits of using elephants as an alternative treatment for children with autism. You’ve heard of pet adoption, but have you heard of coral adoption?! Anantara Hotels, Resorts & Spas know that coral reefs are much more than just snorkeling spectacles. In fact, the Maldives’ Baa Atoll region is full of coral that helps protect the pristine beaches at Anantara Kihavah Villas and guard Kihavah Huravalhi Island’s crystal blue lagoon, as well as also supporting an astounding array of tropical fish and other sea creatures. However, coral is a fragile organism and vulnerable to extreme weather and sudden environmental changes. To ensure countless beach vacations in the future and more importantly, the health of our world’s oceans, Anantara Kihavah Villas has started a coral adoption program. During the construction of the villas, the resident marine biologist created coral gardens and attached coral to iron frames to promote the flow of water and nutrients and to encourage coral to grow faster than it would naturally. Guests at the resort can now contribute to on-going reef conservation by adopting one of these coral frames from the resort’s website. By purchasing a small frame at $100, a medium frame at $200, or a large frame at $400, you can help save our oceans! take care of your buns – those in your hair AND those of your derriere! The “French Paradox” diet may still be a mystery, but guests of Park Hyatt Paris-Vendôme now have unfettered access to two Parisienne beauty secrets. At the hotel’s exclusive new hair salon, Suite 101, celebrity stylist John Nollet offers expertise gleaned from working with such clients as Marion Cotillard, Diane Kruger, Uma Thurman, and Johnny Depp. For below the neck pampering, the hotel’s Le Spa has partnered with Martine de Richeville, director of Centre Svelt’coaching Massage in Paris, to offer Martine’s unique anti-cellulite massage treatments for a derrière par excellence. Fresh off of his “Hair Room Service Around the World” traveling salon tour partnership with Louis Vuitton, John Nollet has just unpacked his bespoke Vuitton luggage and taken up permanent residency at Suite 101. The salon, designed in partnership with the Le Coadic-Scotto architectural group, features five separate booths and a private terrace where guests can have their hair styled en plein air. Suite 101 stylists offer a menu of coiffing options named for some of history’s boldest female pioneers, such as the aviatrix Amelia Earhart and explorer/writer Alexandra David Neel. Better than a replica of the stylish pilot’s signature crop cut, the Amelia Earhart is a trans-atlantically chic combination of balayage highlights, shampoo, massage, hair treatment, cut and style. Alexandra David Neel’s namesake style may not give locks superhuman powers to traverse China and Tibet by foot, but the balayage highlights, scalp massage, and style may have been just what Alexandra’s strands needed at the end of such a journey. Two signature services are offered by Mr. Nollet himself, who spends upwards of two hours on a cut to ensure its perfection: the deceptively simple sounding ‘cut’ and ‘cut and color’ for ladies looking for a style that is le meilleur de meilleur. Visits with a salon stylist begin at 120 Euro for a shampoo and blowdry, and an appointment with Monsieur Nollet begins at 700 Euro for a cut, 1000 Euro for a cut and color. Great hair can make just about any outfit, but perfecting a birthday suit may take an extra dose of elbow grease. Martine Richeville’s signature Remodelage treatment, a detoxifying recharge to the lymphatic system that boosts circulation and minimizes the appearance of perennially unfashionable cellulite, should do just the trick. A vigorous massage is applied to the entire body using a technique that both calms and energizes the mind and body, expertly zapping cellulite manually, the French way. Women’s and men’s Remodelage treatments are currently offered at Le Spa –both are 50 minutes and 180 Euro. Faut souffrir pour être belle? Not at Park Hyatt Paris-Vendôme. Want to spin where Kings of Leon have spun? Or slink into a dark booth where Kate Moss has partied away? Well here’s your chance! London’s famous Met Bar, a hangout for celebs and royals alike since its opening in 1997, will be undergoing a complete renovation and selling off every inch of the iconic original. All proceeds go to the “Teens Unite – Fighting Cancer,” the Met’s official charity partner. Turn a boring living room into a piece of history, all for a good cause. Everything is for sale including the famed private booths, the DJ decks used by renowned DJs and artists including Oasis, Roger Taylor, Boy George, and even Bruce Willis, and glassware, tables, chairs, and bar stools. The bar officially closes on July 31 and is to reopen in September with a new sophistication and London-cool factor as well as the best mixologists, cocktails, and food in the city. Sale ends August 1, 2011. 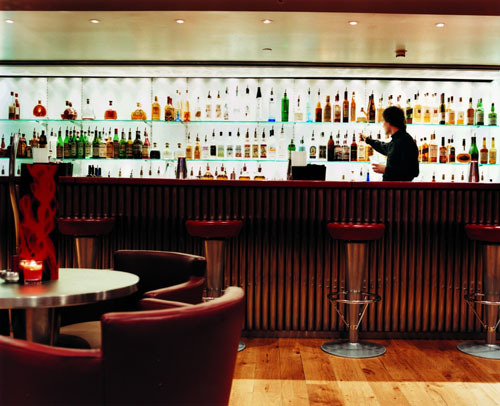 The Met Bar is located in the Metropolitan London, part of the COMO Hospitality Group. Feel like a hair dryer is blowing directly into your face each time you step outside? Air conditioner ailing amid the 100 degree temperatures? And are you afraid that if you stand in front of your open freezer door one more time your electricity bill may look more like your monthly rent? 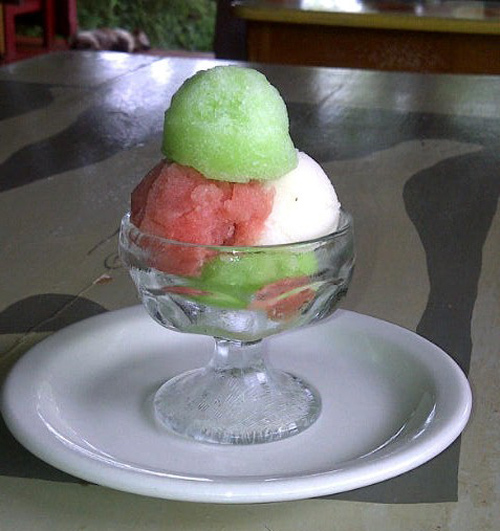 Jakes in Jamaica feels your pain and has decided to share the recipe for their homemade sorbets, which launched this month at the chic bohemian resort. If you can’t make it to Jamaica this weekend, follow these simple steps to create your own frosty clouds of Jakes-tastic sorbet bliss. 2. Blend at low and increase to high for 30 seconds until stiff peaks form. Serve immediately. 3. 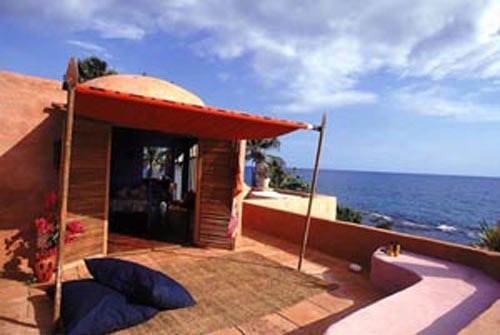 Tweet (@jakeshotel) a photo or comment about your creation (ours is below!). With rates at Jakes starting at $95 per night this summer, there’s no reason not to head down to the island’s South Coast. It may be hot there too but it’s hardly a case of “out of the frying pan, into the fire” … I think we can all agree that taking a dip in the Caribbean Sea is the best way to beat the heat! *What exactly is Soursop? Native to the Caribbean, this funny fruit may be prickly and green on the outside but inside is an edible white pulp with a is sweetly tropical flavor. Voyage Privé is the only travel flash sale site that offers flight-only deals. Additionally, Voyage Privé offers a flexible cancelation policy, the option of purchasing travel insurance, and an excellent customer service team available to all members by calling 1-877-456-345. 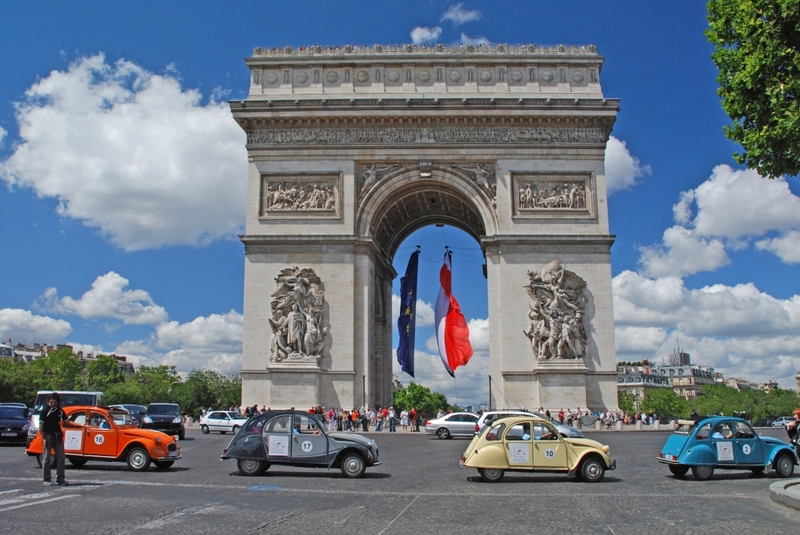 Click here to join Voyage Privé. Voyage Privé is the first and world’s leading private online travel sale site, offering members exclusive travel packages at up to 75% off. Founded in France in 2006, Voyage Privé has since launched country-specific sites in Spain in 2008, Italy in 2009, and the UK and US in 2010. Voyage Privé works directly with luxury travel partners to bring the highest quality travel packages and best prices to over 6.5 million members worldwide. Switzerland’s Palace Luzern introduces new “Under 30 Evenings”, designed for the young, fabulous and… budget conscious. Every Wednesday, at the hotel’s Jasper restaurant, guests under the age of 30 can enjoy a three-course menu at a reduced price – proving that a Michelin-starred gourmet dining experience doesn’t have to burn a hole in your wallet! 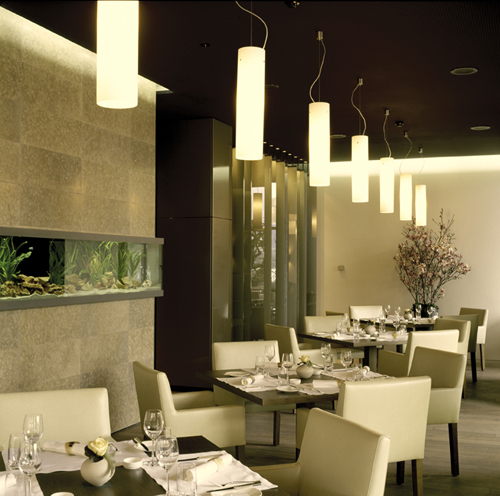 30 – Maximum age limit to take advantage of the special three-course menu, including aperitif, coffee and mineral water. 59 – Cost in Swiss Francs for the dining experience (approximately $70 USD). 16 – Points Jasper earned by the esteemed French restaurant dining guide, Gault-Millau (ranked on a scale from 1-20). 1– New Chef de Cuisine, Kersten Rishmeyer (she creates the menus for Jasper on a weekly basis, using local ingredients). Set within the cosmopolitan city of Lucerne, Switzerland – home to the crystal clear Lake Lucerne, with many public swimming areas, over 115 miles of hiking paths, numerous wineries, and more than 80 festivals a year – the destination is perfect for any young traveler. For more information, visit www.palace-luzern.ch or call 41 (0)41 416 16 16. Jamaica has long been a beautiful island getaway, and this summer it’s definitely the place to be! With off season rates starting as low as $95 a night at hotels like Jakes in Treasure Beach, it’s now more accessible than ever. Take a trip down to Jamaica this summer and see what all the buzz is about! If a trip isn’t in your near future, follow Island Outpost hotels (@iohotels) on Twitter for all the deets on island happenings. … And be sure to check out the complete list of Beach Tomato’s People’s Choice Winners here. Swiss design doesn’t have to be all about strict minimalism and clean lines. Victoria-Jungfrau Grand Hotel & Spa in Interlaken has declared ‘auf wiedersehen!’ to such Swiss tradition by renaming Suite 250 the ‘Yash Chopra’ Suite and converting all 915 square feet into a Bollywood wonderland as a tribute to the famous Indian film director and newly-appointed Interlaken Ambassador, Yash Chopra. With nary an equilateral red cross to be found, the suite’s walls are adorned with posters of Mr. Chopra’s award-winning film Veer-Zaara, while decadent silk fabric and gold motifs appear throughout. Thun-based design firm Raumforum selected whimsical Indian touches for the living room space, including a lacquered white Ganesha sculpture and velour leopard-print pillow cushions that pop against the deep neutrals of the leather furnishings. Additional Indian accessories include traditional Indian carpets and silk bedspread, while an Indian tea service is available for Bollywood stars and starlets to enjoy a cup of morning Darjeeling. 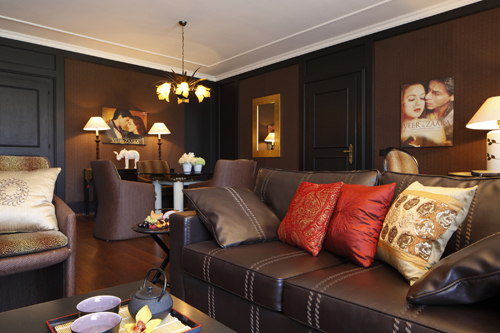 The Yash Chopra Suite includes a living room, bedroom with en suite bathroom, and guest bathroom. It has its own balcony with views of the Jungfrau Massif and is available from 2,250 CHF, approximately 2,695 USD, for two, breakfast buffet included.